A new, updated 1080p version of the Oculus Rift VR headset cuts the latency of the original Rift, making it an even more enjoyable experience when playing games. One of my earlier experiences with the Rift came as part of the roller coaster demonstration that I, along with much of the PCWorld and TechHive staff, tried out back in November. I'm fortunate that I generally have a settled stomach, so that incredible VR coaster was exhilarating, but not nausea-inducing. At the Intel booth here at CES, members of the CCP Games team showed off their latest game, Eve: Valkyrie, a first-person space shooter that takes place in the Eve virtual world. Unfortunately, members of the Oculus team were not around to answer questions. 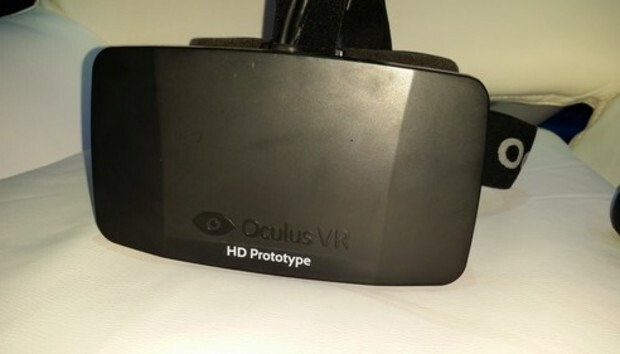 There appears to be two different prototypes of the Rift floating around the show here: The version that I saw had "HD Prototype" emblazoned on the front. A "Crystal Cove" version that Polygon tried out appears to have some spatial positioning built in, so that one can "lean" into the virtual controls, for example. Regardless, the HD version we saw appeared to be smaller and more compact than the SD version the PCWorld staff played with last summer. Without the two products side by side, it's difficult to compare weight, although it certainly felt less bulky than I remember, with far less mass sprouting from my forehead. One of the CCP team members warned me to avoid barrel rolls, triggering a brief burst of panic. It was 7am, and the last thing I wanted was to spew my newly-consumed coffee all over Intel's carpet. Fortunately, nothing of the sort occurred. Perhaps the most noticeable problem with the Rift was the tendency to wander out of focus, diminishing the sense of realism. I found myself holding the controller with one hand (bad for gameplay) while trying to adjust the headset with the other. A CCP employee told me that constantly moving the headset diminished the problem, although I can't be sure. All told, the HD prototype delivers about 100 milliseconds of total latency, far lower than the 500 milliseconds or so of the SD prototype, the CCP employee said. The goal is to reduce that number to about 50 milliseconds, the point at which your mind begins to accept the simulation as "real," rather than a construction. Eve: Valkyrie, as shown, is fairly simplistic: Each pilot's ship fires guns and missiles. But to "lock" each missile, you must "watch" the target until the missile locks. That means that, while playing, you end up craning your neck around as you would just like a "real" dogfight. Chances are that you'll fly your ship in the direction that you're looking, but not necessarily: I almost crashed into an asteroid as I watched my missiles turn a raider into space dust. I'm not sure about the long-term effects of playing using the Rift. It seems like the weight will wear on your neck and shoulders over time. And the power of live, immersive video means that Sony's VR offering may be even better than the Rift itself. But in my mind, the new HD version of the Rift makes a very good gaming peripheral even better.